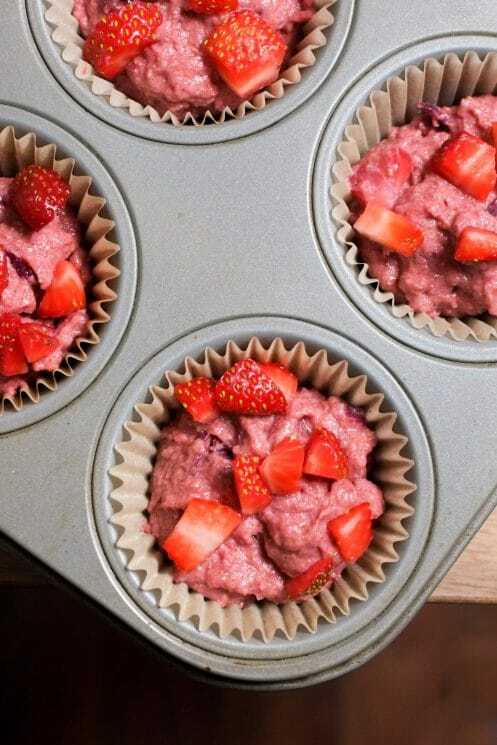 Sweet strawberry muffins with beets for color and nutrition! 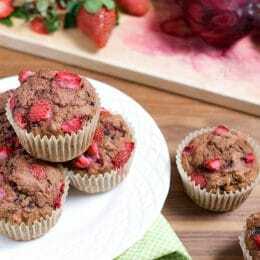 We used very little sugar, no oil, and 100% whole wheat, so moms and kids can agree on these colorful strawberry beet muffins. With Valentine’s Day right around the corner, I wanted to make something special. Something pink, red, sweet, and delicious. But also healthy because we all know there’s enough decadence on this holiday as it is! 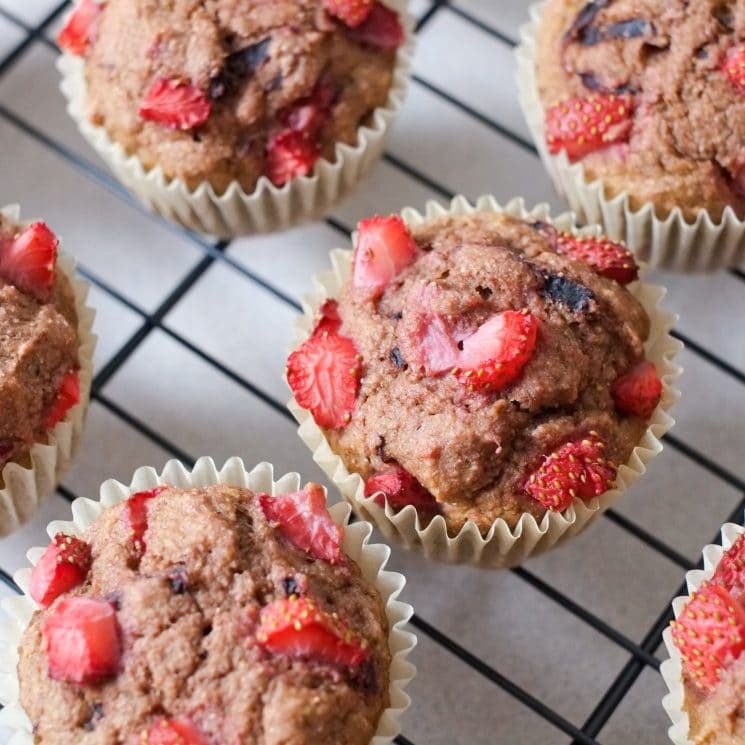 I came up with a beautifully festive pink-battered muffin: strawberries + beets. A match made in heaven. The batter is just beautiful! I wish they stayed as beautifully pink when cooked, but at least they remain nutritious! 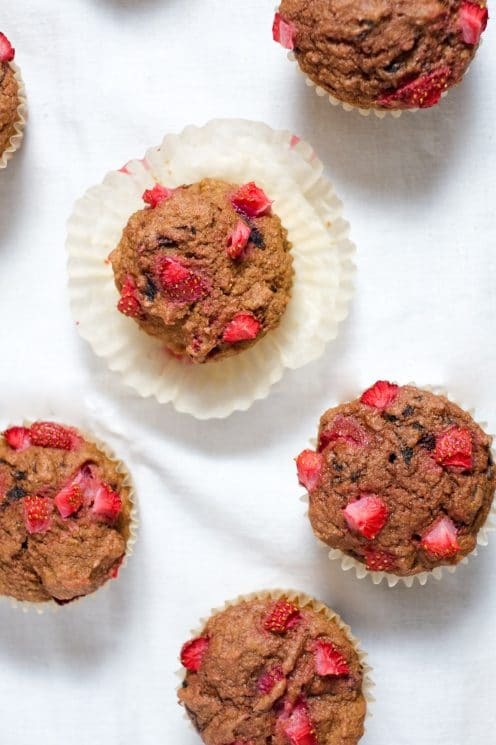 I seriously love these muffins because a) they taste like strawberries, b) they’re light, fluffy, and moist, and c) they’re pretty much guilt-free! Even my husband liked them, and he’s a self-avowed beet hater (they’re one of two things he doesn’t like) – you can only taste beets if you’re looking for them. 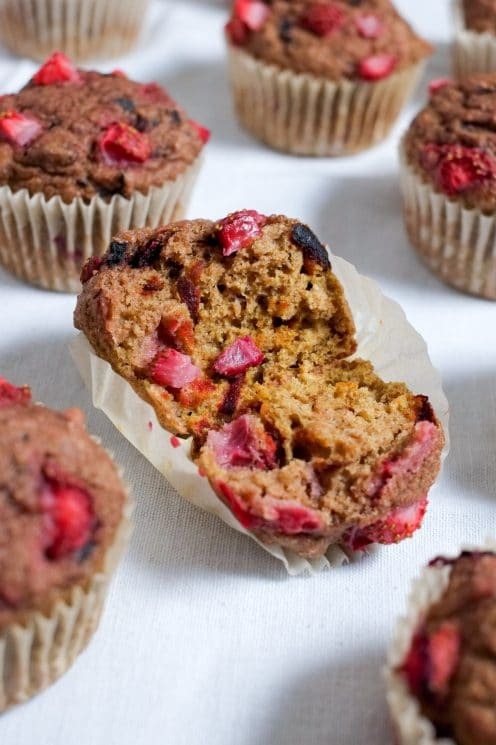 What makes strawberry beet muffins good for you? Where do I start with these? Strawberries – they’re high in vitamin C, manganese, and antioxidants. Plus, they’re just beautiful and oh so delicious. A ripe strawberry is one of my favorite things. And then the beets! I’ll admit it – this is actually my first escapade into the world of beets. My husband hates them and I never grew up eating them. But after doing my research I think I’m converted! Beets are amazing because they have lots of folate! This is super important for expecting moms, but also for kids. Folate is necessary for growth because it helps with cell division, and a lack of it can lead to anemia. Beets also contain manganese and potassium, as well as high amounts of anti-inflammatory antioxidants. And don’t throw away those beet greens! They’re not only edible, but incredible! They pack in super high amounts of K, A, and C, as well as copper, potassium, vitamin B2, and so many others. Eat them raw like lettuce, saute them in a little olive oil, or throw them in a soup. Next time I think I may blend them up into the muffin mixture itself! Speaking of which the muffin mix is pretty great too because it’s 100% whole wheat with only 1/2 cup of sugar for 30 muffins. Plus, we used applesauce instead of oil, so these are nice and light. They have a wonderfully perfect texture even without oil! Let’s prep first. Preheat the oven to 350* F and line or grease a muffin tin. Rinse and dice a 16 ounce package of strawberries so that you have nice small pieces. Clean your beets well and remove stems. Don’t throw them away! These are edible and really nutritious – save them for salads or to throw in soups or smoothies. Peel beets (the skin tastes extra earthy) and then grate them. They’re rather hard, so I found grating at an angle worked best for me. Now in a medium sized bowl combine all dry ingredients: flour, baking powder, baking soda, salt, and cinnamon. Combine wet ingredients in a large bowl: applesauce, eggs, vanilla, and sugar. 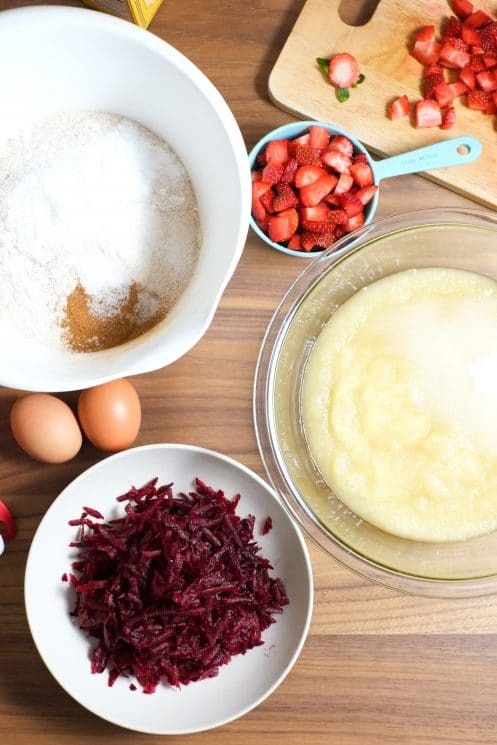 Now stir in the cup of grated beets and most of the diced strawberries – reserve about 3/4 cup of strawberries for topping later. Mix well, squishing strawberries to release juice as you go. Slowly add the dry ingredients into the large bowl with wet ingredients. Mix well. Drop large spoonfuls into prepped muffin tin, filling about 3/4 full. Top with a sprinkling of reserved strawberries. Bake for 20-25 minutes, until a toothpick comes clean out of the center. Err on the side of a little more done if you plan to save these – the fruit ingredients moisten them as they sit, so the tops of mine got a little soggy since I usually pull mine out on the early side. Store in an airtight container for a few days, and freeze the ones you don’t get to for later! Preheat oven to 350* F. Grease or line a standard muffin tin. Rinse and dice a 16 ounce package of strawberries into very small pieces. 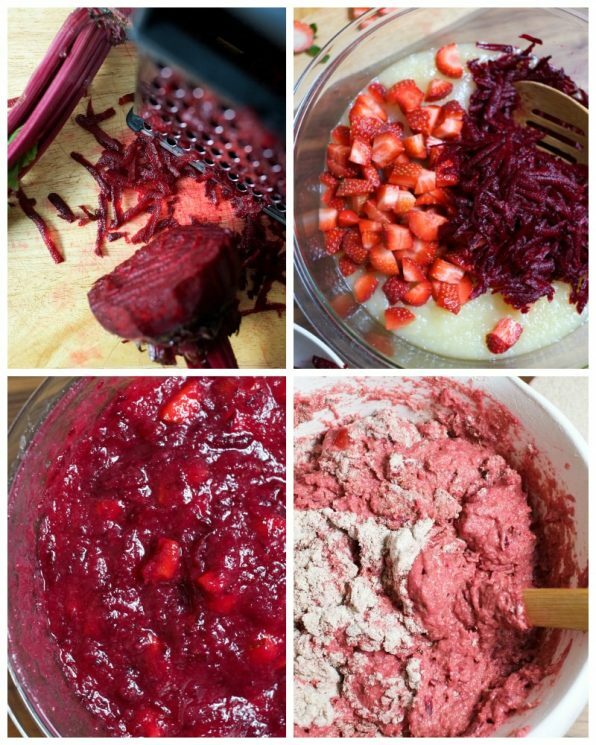 Rinse, peel, and grate 1 cup of fresh beets (be careful, they stain!). Mix dry ingredients: flour, baking powder and soda, cinnamon, and salt. In a large bowl, combine applesauce, sugar, eggs, and vanilla. Stir in 1 cup beets and all but about 3/4 cups of the strawberries (this is reserved for topping later). 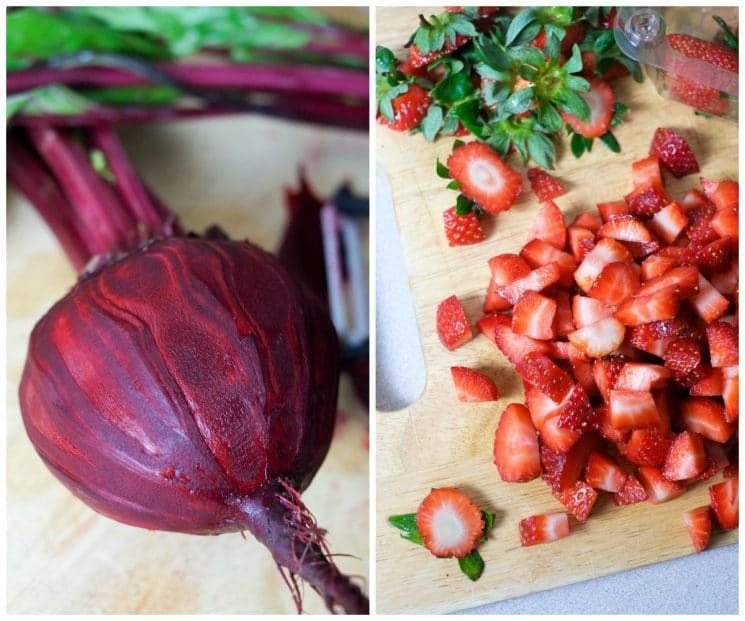 Smashing the strawberries as you mix is a great way to release their juices into the batter. Slowly add dry ingredient mixture into the applesauce mixture. Spoon mixture into muffin tin, filling each about 3/4 full. Top with sprinkles of set-aside strawberry chunks. Bake for 20-25 minutes, until a toothpick inserted into the center comes out clean. Allow to cool to room temperature before eating. Wonderful idea to blend! Cocoa powder also sounds delicious 🙂 So glad you liked them! You mentioned you used applesauce instead of oil. What if i didnt want to add applesauce and use oil instead? What is the measurement? Also could i use honey instead of sugar? Hi Raisa! I haven’t tried using oil in this particular recipe, and since it calls for so much I wouldn’t advise replacing 1 for 1 like I usually do when replacing oil with applesauce. If you replace part with oil I would also increase other wet ingredients (maybe more strawberries mashed up) or add some water. I wish I could say exactly, but I really haven’t used oil for this. As far as honey goes, that should work just fine – I would use the same amount. If I substitute blanched almond flour for the wheat flour 1:1 would it work? Thanks!! Hi Corinna – good questions! I haven’t used pre-cooked beetroot so I am not sure – but I bet it could work. It may be a little more watery than uncooked beets, so just use your best judgement and adjust ingredients if it’s too wet. As for applesauce — I don’t know how it compares with what you’re thinking of in the UK. How funny! Applesauce here is just cooked apples that are blended up, so if it’s that then that’s what you can use! Otherwise just boil some peeled, sliced apples with a tiny bit of water and lemon juice until soft and then blend them up. Hope this helps! This recipe looks great, but my kids are allergic to egg. I typically substitute applesauce but since the recipe already calls for applesauce, I am stumped. Do you have any suggestions? 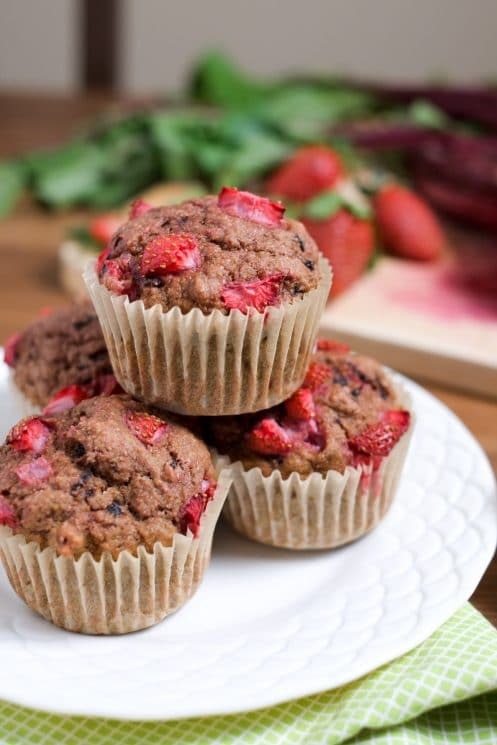 Hi Kim, I think flax eggs would work well with these (though I haven’t tried it yet). For 1 flax “egg” mix 1 tablespoon ground flax seeds + 3 tablespoons water and let it sit for a few minutes. Let us know if you try it and how it goes! Amazing, can’t wait to make & try these. What is the texture and taste like? I worry about the amount of applesauce. I’ve made so many healthy expensive recipes lately only to end up with sponge like muffins with no taste. Do you taste the strawberry with so much applesauce? Are they spongy as opposed to muffin texture? The taste is sweet and you can definitely taste the strawberry. The texture is more spongy than cake-like because of all of the healthy produce that is included in this recipe.